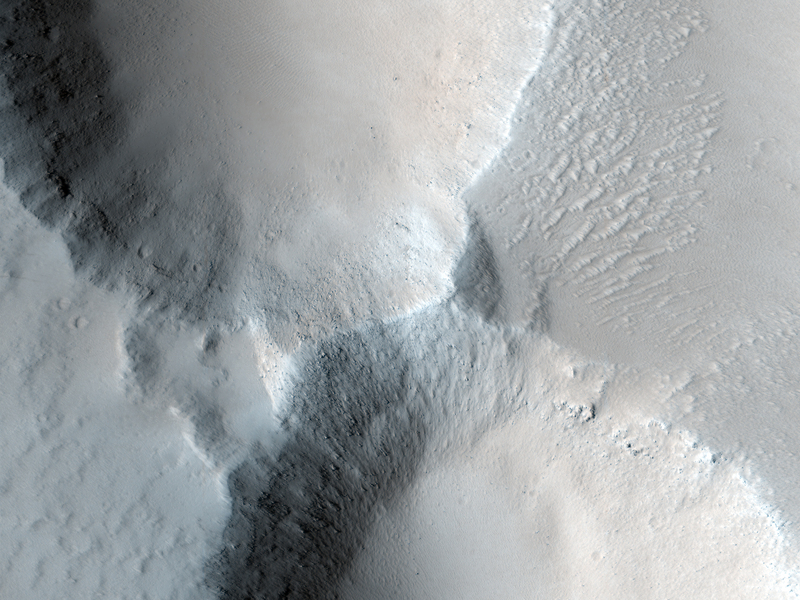 This image shows two related features: a trough with a succession of pits in the center. The trough, formed by the roughly straight scarps trending NW-SE, is a graben, a tectonic feature formed when a block slides downwards along two faults facing each other. Graben are found in many places on Earth, with some of the best-known examples in the canyon lands area of southern Utah. A succession of pit craters is found in the center of the graben. These are rimless pits, roughly circular, which form via collapse. On both Earth and Mars, they are commonly found in volcanic terrains. They may be due to collapse into void space left behind after propagation of a lava-filled dike. An interesting aspect of this site is that some of the pit craters are nearly filled with some mantling material, while others have relatively smooth floors and appear empty. Since this material may have been deposited regionally, this suggests that the pits formed at different times.